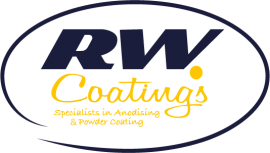 RW Coatings are a family run leading provider of Aerospace, Automotive, Defence and Architectural Powder Coating and Anodising. They are AS 9100 Rev D approved and ISO 9001:2015 (They received the 1st BSI approval for both standards in Ireland). They are based just outside Belfast and have been in business for 8 years supplying the architectural and aerospace industries, with conitnued investment in the services they provide. RW offer a wide range of cosmetic finishes for the aerosapce and defence industries from black anodising, clear anodising, bright anodising, chromate conversion and a range of besoke dyed anodising finishes. RW offer bespoke colour matching in powder coating working along side Europes top powder manufactures. They work to Rapid-Response on a daily basis, with no corners cut. RW pride themselves on quailty of product and service.